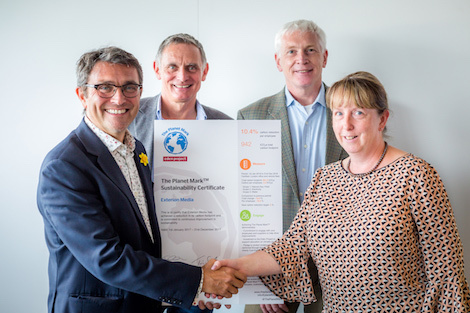 Exterion Media, Europe’s largest privately owned Out-of-Home (OOH) media company, has retained The Planet Mark™ sustainability certificate for a fourth year in the UK, after achieving an 11% cut in its total carbon emissions in its latest 12-month reporting period. Exterion Media’s total carbon footprint at the end of 2016 stood at 942 tonnes of CO2 equivalent (tCO2e), a decrease of 10.9% from 2015 on a normalised basis. Its relative carbon footprint in 2016 was 2.52 tCO2e per employee, compared to 2.81 tCO2e in 2015 – a 10.4% reduction. The cut follows a major push by the company to reduce electricity consumption, down 18%, and a 12% decrease in carbon emissions from fleet cars. Going forward, Exterion Media said it planned to focus on securing innovative solutions for the by-products of its activities; continue to reduce embodied energy in Exterion Media assets and continue to reduce the impact of its logistics as it accelerates its journey to becoming a Digital Media Company powered by data. Holders of The Planet Mark™ have a minimum requirement to reduce their carbon emissions by 2.5% per year.